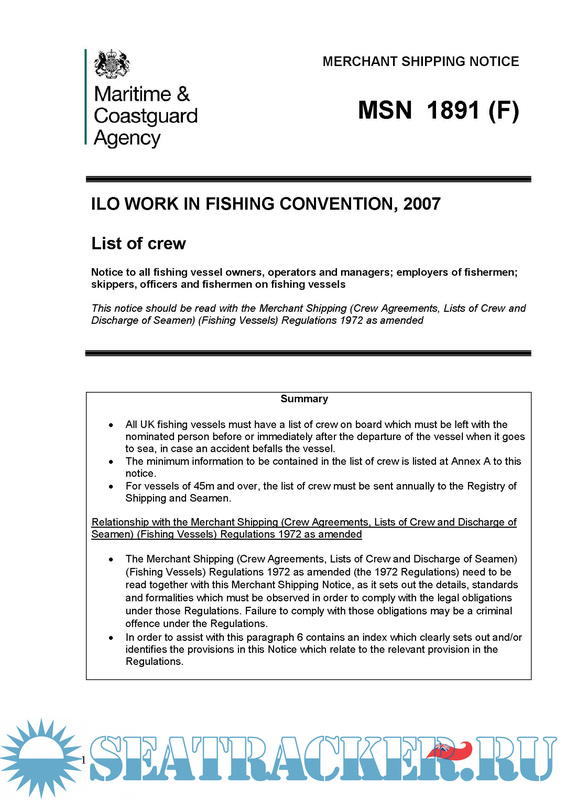 Description: The Merchant Shipping (Work in Fishing Convention) Regulations 20181 (“the 2018 Regulations”) implement Article 9 of the ILO Work in Fishing Convention, 2007 (ILO 188) which sets the minimum age for those working on fishing vessels and requires additional protection for those under the age of 18 years. 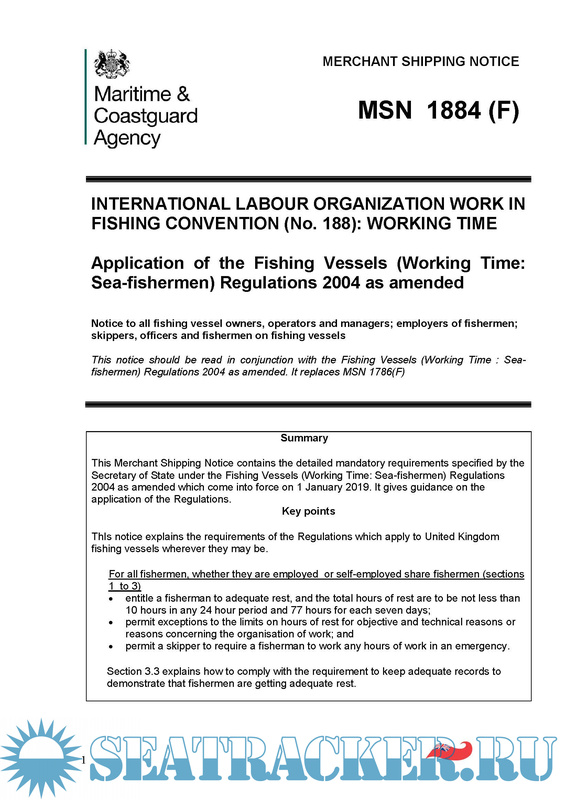 The Fishing Vessels (Working Time: Sea-Fishermen) Regulations 2004 (referred to in this notice as “the Regulations”), have been amended to bring them fully into line with the International Labour Organisation’s Work in Fishing Convention 2007 No. 188 (“ILO 188”). This extends the requirements for minimum rest to all fishermen, regardless of their employment status. The Regulations also implement Directive 2003/88/EC (the Working Time Directive) in so far as it applies to fishermen. 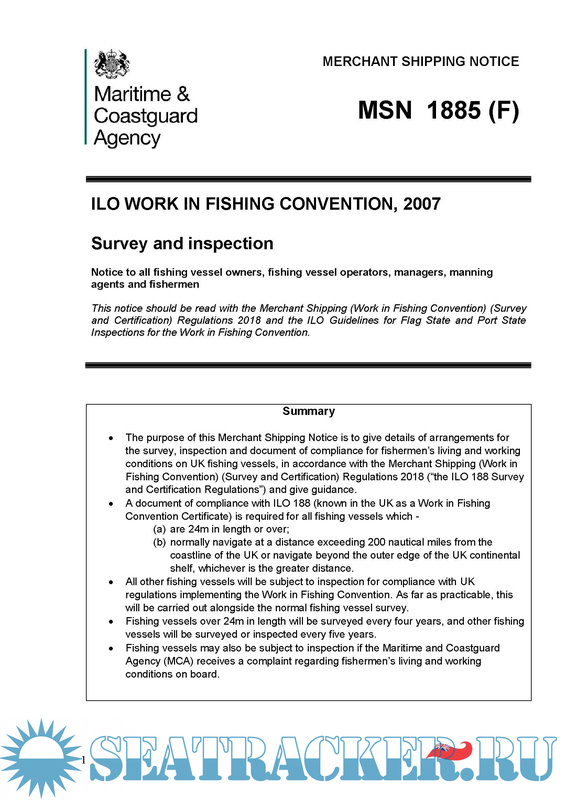 The ILO Work in Fishing Convention (ILO 188) requires ratifying states to establish a system to ensure that fishing vessels which fly its flag comply with the requirements of the Convention. The UK will do this by regular inspection of living and working conditions all UK fishing vessels, where practical alongside the regular survey of the fishing vessel. In addition, fishermen will be able to raise a complaint with the MCA if they believe that their living and working conditions do not comply with the Convention. Information about the complaints system is contained in MGN 589 (F). The master of any United Kingdom ship is required to have a list of the crew currently engaged on board. A copy of the list must be delivered to the nominated person when the vessel is at sea. The purpose of this is primarily in case the vessel goes missing, so that those ashore or the authorities responding to an incident know who was on board and the next of kin can be contacted. For vessels calling in foreign ports, a list is also required for immigration purposes.